The subtropical gye and Ekman transport only happens in the upper ocean (upper 700m), doesn’t it? If it is, how the heats are transporting downward and links to ENSO? (ENSO is also a signal in the upper ocean 700m). 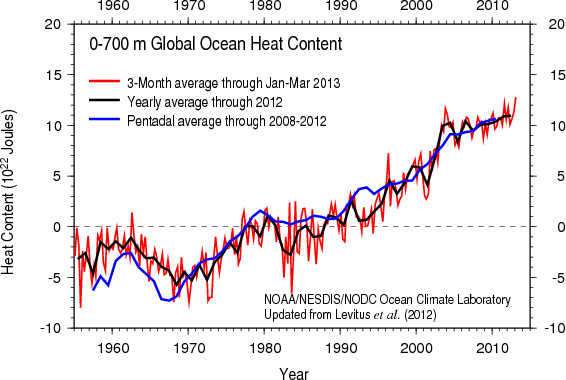 Is the heat transportation to the deeper 700m ocean due to vertical mixing or change of general circulation?? @48 If your speculation is correct, I assume that another consequence would be that, if/when concentrations of greenhouse gases start to drop, corresponding reductions in surface ocean/land temperatures would take place at a much slower rate than would otherwise be the case: the surplus heat stored in the deep ocean will gradually make its way to the ocean surface, and continue to warm the atmosphere for decades, if not longer. Thanks Rob for mentioning the ocean gyres. Further was all this forecasted, again Rob Painting wrote a very good blog on this topic too, in June of this year. How does the extremely cold water (2-3C)of the deep ocean, warm the 18C ocean surface water precisely? Thanks Gavin, I needed a laugh. It’s nice to remind people of some of the real fundamentals. We don’t live in the PETM, we live here and now and this is the only climate we’ve got. It’s worth repeating the closing statement from the recent American Meteorological Society Climate Change Statement: Prudence dictates extreme care in accounting for our relationship with the only planet known to be capable of sustaining human life. 2. If so, how much confidence should we have in the ability of these scientific instruments to measure temperature of the ocean that accurately? I don’t know anything about them, and hope you can tell me. There have been decades, such as 2000–2009, when the observed globally averaged surface-temperature time series shows little increase or even a slightly negative trend1 (a hiatus period). However, the observed energy imbalance at the top-of-atmosphere for this recent decade indicates that a net energy flux into the climate system of about 1 W m−2 (refs 2, 3) should be producing warming somewhere in the system4, 5. Here we analyse twenty-first-century climate-model simulations that maintain a consistent radiative imbalance at the top-of-atmosphere of about 1 W m−2 as observed for the past decade. Eight decades with a slightly negative global mean surface-temperature trend show that the ocean above 300 m takes up significantly less heat whereas the ocean below 300 m takes up significantly more, compared with non-hiatus decades. The model provides a plausible depiction of processes in the climate system causing the hiatus periods, and indicates that a hiatus period is a relatively common climate phenomenon and may be linked to La Niña-like conditions. The general pattern of warming and ocean circulation in the model, during these hiatus periods, is very similar to that which occurs over shorter timeframes in the La Niña phase of ENSO. Strong upwelling in the equatorial eastern Pacific brings cold water up from the deep, which cools air temperatures in this region. Meanwhile in the subtropics of each hemisphere, heat is piling up and being driven down into deeper layers. Not only does the climate model-based study, Meehl (2011), show heat is buried into deeper ocean layers when global surface temperatures stall, but it also presents plausible mechanisms in ocean circulation that transport heat down to the deep ocean. The general pattern of sea surface temperature during these hiatus periods is very reminiscent of a La Niña-like climate state. The natural variability ‘flip-side’ to these hiatus decades, are periods where there is greater-than-average surface warming (see inset in Figure 2). So at some point in the very near future we can probably expect surface temperatures to gather up a head of steam, and begin rising at a rapid rate. @52 – No, the subtropical gyres can reach down into the deep ocean. See the observations in Roemmich & Gilson (2009) – The 2004-2008 mean and annual cycle of temperature, salinity, and steric height in the global ocean from the Argo program. Only a snapshot of course, but note where the deep ocean warming (as indicated by the mean steric height over the period) is occurring. Ekman transport may be confined to the surface layers, but when the circulation spins up, the greater rotational speed of the gyre increases the rigidity of the Taylor column at its centre. The gyre shifts poleward and the column lengthens. The sum effect is to displace isopycnals (parcels of water of the same density) vertically in the column, i.e. the deep ocean warms. May be easier if you understand that the circulation in the surface layers is not closed, there is transport/seepage. As for ENSO. See figure 5(a) & (b) in Stefan’s post. Imagine the left-hand side is the western tropical Pacific Ocean, and the right-hand side the eastern tropical Pacific. When the easterly trade winds strengthen during La Nina it pushes water along the equator from the east to west. This occurs because the Coriolis Force is zero at/near the equator. That isn’t the case as one moves further away from the equator. Anyway, much of the heat is forced down below the surface in the west. That is one reason why sea level rise in the western Pacific basin is much higher than the global average throughout the period of satellite-based observation (1993-to present) – the wind-driven circulation moved to a more intense phase throughout the duration of satellite altimetry. Based on past observations, dating back to the 19th century, this is unlikely to last. Think of the ocean heating during La Nina as removing $80 monthly from a deposit of $100 monthly for a net deposit of $20 . During El Nino, you are removing only $70 monthly, for a net deposit of $30. Alana Miller asks: how can a withdrawal add $10 a month? 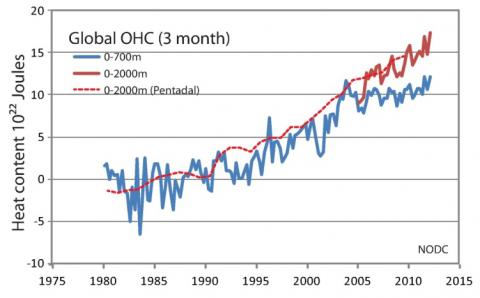 But isn’t the ocean heat storage far, far, smaller than the GHG forcing/net human-made forcing. The 0-2000 metre ocean is only absorbing 0.5 W/m2/yr but the net Human forcing is going to be reported by the IPCC tomorrow as 2.3 W/m2/yr. Is there any reason to believe that after these La Niña dominated years climate warming will ‘play catch-up’? That is should we expect greater than normal warming until we reach the average warming of the last decades (revert to the mean)? Or does this pause mean that it will take approximately 15 years longer to reach the global temperatures projected for the end of this century? What is the measurement uncertainty of the temperature data that underlies the heat content calculation? Are there even thermometers that can reliably measure a difference of 0.04ºC? Paulw – Net forcing changes since the Industrial revolution (about 1.6 W/m^2 in AR4) are not the same thing as the current top of atmosphere radiative imbalance (about 0.5-0.6 W/m^2 over the last 30 years based on OHC) as the climate has warmed over that time, and has already reacted to much of that net forcing change. You are confusing a rate with a summation. The only way for the TOA imbalance to be equal to the net forcing change would be for the Earth to somehow not warm over the last 250 years in the presence of that imbalance. And that’s not the case. Will the rate of sea level rise, due to ocean warming and thermal expansion, be somewhat faster than predicted in previous reports? 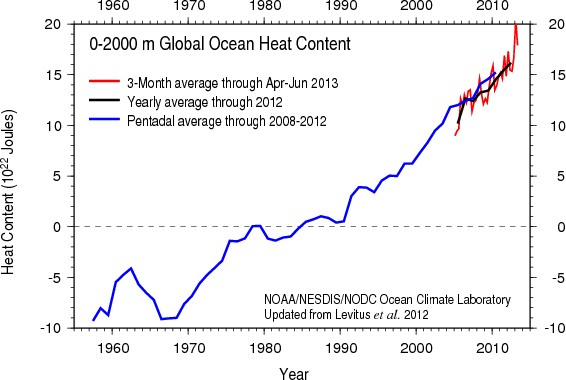 Thus the fact of the heat being stored more in the deep oceans is NOT some sort of climatic get-out-of-jail-free card? It is apparent in Figure 1, that the hiatus and accelerated warming decades are virtually the mirror image of each other. The warm sea surface temperatures in the gyres, during hiatus decades, indicate convergence of near-surface currents and strong downwelling of heat. With accelerated decades the vertical, and poleward, transport of heat by the gyres seems to shutdown, enabling strong sea surface warming in the tropics – where most solar radiation enters the ocean. The strong warming in the polar regions is related to changes in the thermohaline circulation. It is fine to have a hypothesis but you need a physical mechanism to go along with it. The oceans are stratified, warmer water floats on top of the huge volume of deeper ocean that is at maximum density and minimum temperature. Whilst cold water can sink as its density increases, say as it is cooled at the poles, warm water cannot do this. Without significant up or down currents, heat can only be exchanged by convection and that is a heck of a slow process. There are significant horizontal currents even in the lowest layer but apart from places where these currents hit continental land masses there is no way to get much up or down currents. So how does this increased heat get down there? It would have to be a fast process or we would see significant heating of the ocean surface, which I don’t believe we have seen this century. Nick O, #65: Will the rate of sea level rise, due to ocean warming and thermal expansion, be somewhat faster than predicted in previous reports? This is very likely, because El Nino years getting warmer and are tied to anomalously high sea levels. Patterns of anomalously high sea levels are attributed to El Niño–related changes to atmospheric pressure over the Gulf of Mexico and eastern Canada and to the wind field over the Northeast U.S. continental shelf. One finds that both the red El Niño years and the blue La Niña years are getting warmer, but given that we have lately experienced a cluster of La Niña years the overall warming trend over the last ten years is slower. This can be thought of as the “noise” associated with natural variability, not a change in the “signal” of global warming. This is consistent with the finding that reduced warming is not mainly a result of a change in radiation balance but due to oceanic heat storage. During La Niña events (with cold ocean surface) the ocean absorbs additional heat that it releases during El Niño events (when the ocean surface is warm). The next El Niño event (whenever it comes – that is a stochastic process) is likely to produce a new global mean temperature record. Then shouldn’t the error bars be displayed? I obviously meant conduction not convection in my last post. Doh!! So how does this increased heat get down there? Kevin Trenberth: We have just published a new analysis showing that in the past decade about 30% of the heat has been dumped at levels below 700m, where most previous analyses stop. The first point is that this is fairly new, it is not there throughout the record. The cause of the change is a particular change in winds, especially in the Pacific Ocean where the subtropical trade winds have become noticeably stronger, thereby changing ocean currents and increasing the subtropical overturning in the ocean, providing a mechanism for heat to be carried down into the ocean. This is associated with decadal weather patterns in the Pacific, which are in turn related to the La Niña phase of the El Niño phenomenon. This is not the same at all. This heat is hypothesised to be going into the deeper ocean which is extremely cold and is stratified. How does it ever get back out to warm the troposphere? If somehow and I can’t possibly imagine how, there was a huge increase in circulation between the surface and the deeper layers of the ocean, that would be disastrous for global temperatures but not upwards but downwards! Be thankful that the we are insulated from the huge volume of cold waters that comprise the ocean, because if it ever became far more mixed with the surface layers we would plunge into permanent glaciation. OK, think about this. 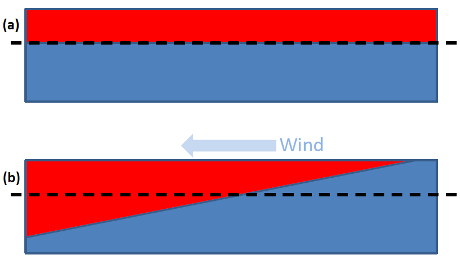 Heat is transferred into the deep by winds increasing mixing. If warm water is mixing down, then cold water is mixing up, right. Now the water down below warms. The next time there is mixing, the water above won’t cool quite as much. We must be at cross purposes here Gavin because a much more well mixed ocean would be disastrous for surface layer temperatures and the impact on the Troposphere. The average temperature of all the oceans water is about 4c compared to the average of 17/18c for just the surface layer. For the past two years I have offered a US$1,000 wager to anyone (denialists or sane people) that rejects the proposition that there will be a new global high temperature record set within five years. I have made the offer to many hundreds of denialists, and none of them will take the bet. Golly, it’s almost as if they do not believe what they claim to believe. I am aware it is not a closed system, that is my problem. How, is it managing to receive all this increased energy and not significantly heat up the Troposphere, for which there is a quick mechanism for doing so, yet at the same time can heat up the deep layers of the ocean, for which there does not appear to be a quick mechanism to do so? AM is suggesting water is trapped at depth. I have read references to the Peru-Chile Trench that described it as the site of significant upwelling. The trench is very deep. If you watch animations of La Nina, the trench is clearly visible as the source of very cold water. You can watch it spread out all the way across the equator. One wonders if we were to fill the trench, would ENSO as we know it survive? From what depth is this upwelling coming? I cannot believe it is not coming from very deep in the trench, the bottom of which is some 20,000 feet below the surface. Gavin, your response to my question is like the drunk man looking for his keys under the streetlight. Man: Where did you lose your keys? Drunk: Over there. Man: Why are you looking for them here? Drunk: It is bright here. > I cannot believe it is not …. turns up journal articles aplenty. It is not unreasonable to focus on the “sphere” where we (and many other species) live. Just because 2% is small compared to 90% doesn’t mean the 2% is unimportant. Global warming would be a non-issue if it were occurring on a lifeless planet like Mars (not that the deep ocean is lifeless, but much of what we care about is at the surface). Scientifically, global warming is defined in terms of surface (or near surface temperature) change, and this extends throughout the troposphere too. It is also a better understood metric than the changes in OHC. People have interest in different things, and this is useful: there is no one metric that fully encompasses what is going with a changing climate. Isn’t it temperature in Centigrade that is originally measured by the ARGO floats? And if so, why change the unit in the first place? See figure 1 in Stefan’s post. The deep ocean warming has been measured. Even if readers don’t understand the principles of oceanography it doesn’t matter, the warming of the deep ocean is taking place regardless. You have that backwards. It’s the surface oceans that are stratified. The deep-abyssal ocean is relatively well-mixed. If you think about it just a little it’s straightforward to work out why. Science is not constrained by your inability to understand how the wind-driven ocean circulation works, or to ignore explanations provided earlier in this comment thread. Anyway, didn’t Stefan already cover this contrarian meme in his Star Trek (quantum teleportation) argument? Now I suspect this information will have no effect on you, but as always this is really written for the benefit of rational readers. Science may not have all the answers, but there is a great deal more known about the ocean circulation than contrarians try to insinuate. Were I a Coelecanth, I might find your criticism valid. Question: when ice melts, does that not result in the storage of large amounts of latent heat in the meltwater? If there has been an aceleration in ice melt in Greenland and Antarctica, the meltwater must contain latent heat that would otherwise have gone into the atmosphere. If this is the case, how much of the heat entering into the ocean system rather than into the atmosphere is this latent heat? The “latent heat” in water would only be released if it froze again. I am well aware of ocean circulation that interchanges water to and from the deep oceans. Again it is the time scales that is the problem. These Thermohaline circulations take hundreds of years or longer. The wind driven coastal upwellings are a tiny fraction of the ocean surface and volume. If the surface layer of the ocean is not quickly exchanging energy with the troposphere, which it can do easily and quickly but retaining the energy, why is it not heating up far more rapidly, If you are saying it is getting rid of it to the deep oceans, how precisely is it doing this so quickly? Please be precise about the mechanisms, volumes and timescales, just saying ocean circulations is not good enough, given what we know about the very long timescales involved to move the water. Alan Millar, in the original post at the top of the page, your question was answered before you asked it. … the wind is turned on. The surface layer … becomes on average colder (less red), the deep layer warmer…. like La Niña (cold eastern tropical Pacific). The winds are the trade winds…. You’re confused by being very small, seeing the ocean as deep, vast, and its depths unreachable. “… another — possibly substantial — source of energy for mixing that’s generated in the ocean where cold, heavy water collides with warm, light water. … turbulence at a front near Japan that is 10 to 20 times more energetic than what the wind could generate…. is likely an extreme example of a process that occurs much more widely in the ocean. “… sea water mixes dramatically as it rushes over undersea mountains in Drake Passage — the channel between the southern tip of South America and the Antarctic continent. Mixing of water layers in the oceans is crucial in regulating Earth’s climate and ocean currents. The research provides insight for climate models which until now have lacked the detailed information on ocean mixing …. From 2009: “Kakani Katija and John Dabiri at the California Institute of Technology have developed a way to estimate the extent of “biogenic” mixing. After conducting field measurements on swimming jellyfish, they built models of how animals mix the waters ocean-wide and concluded that the effect may be extensive. And where are those organisms active? Well, that changes day to day. Tough to model, but living organisms aren’t trivial in affecting how climate works, and changes in what’s alive where and when are feedbacks to climate change. The critical point we must not forget is that an increase in GHG creates an energy flow imbalance by slowing down the rate of energy loss to space from outgoing radiation. The only way you can balance the equation is by a temperature increase to increase outgoing radiation (or by changing the atmosphere in the opposite direction). If there is a “pause” in temperature change while the oceans absorb the excess, this isn’t a good thing. We are just changing the order of events a bit because an increase in surface temperatures would in any case eventually increase the energy content of the oceans. I have an article on one of my blogs about why we need to focus on energy. Ideally we should measure this energy imbalance directly but I seem to recall reading a James Hansen paper where he quantifies the net flow and explains why we cannot measure the difference between inflow and outflow to sufficient accuracy using satellites. But I would have thought rather direct indications of an increase in net planetary energy like rapid loss of Arctic sea ice should be enough to convince anyone that there has been no “slowdown”. @89 – You misunderstand. It’s not my job to educate you about oceanography, that’s your job. You don’t appear to have read the papers I have previously referenced, so it appears ideological blinkers are preventing you from accepting the scientific evidence. This was apparent earlier in the thread, when you claimed the deep ocean warming was hypothesized. This despite the fact that the first graph in Stefan’s post stands out like a sore thumb, and shows the observed warming of the ocean down to 2000 metres. Why exactly should the ocean behave according to a hypothesis you appear to have formulated whilst sitting on your sofa? My advice would be to undertake tertiary studies in oceanography, then you actually understand the topic you erroneously think you know so much about, and can make some of the basic calculations yourself. Here’s a hint though: Earth’s rotation, and the division of the ocean into basins by the continental land mass configuration, play a large role in Ekman pumping and suction. Alan, we aren’t talking thermohaline transport. We’re talking wind-driven mixing. Not the same. I figured that is the only probable mechanism but where is this taking place in the volumes necessary to rid the upper layer of the extra energy so quickly? The coastal wind driven upwellings are well known and they drive a good proportion of the world’s shipping industry. Has there been a change there? Even so the proportion and volumes involved, of the total volumes, look far to small to get rid of the surface layers excess energy, nowhere near enough interchange. Where is this change in wind driven interchange happening and in what volumes? If it was very significant it would surely have a noticeable regional affect on troposphere temperatures which we would become aware of. Alan, read the papers in the recent literature section cited above. Alan, glancing at what’s readily accessible from where you’re sitting would help you — otherwise you’re asking us to go find the review articles in the field and summarize them for you. If you let people know how much you’ve found out by looking, experts may show up to fill in real gaps. Asking questions that way works better. “What is important about X” is a homework-help question. I thought the comments up thread about coal aerosols in China were interesting. Is there a relationship between the cooling these aerosols cause and the increase in trade wind strength? Could this be estimated using a climate model? Recently, there has been considerable discussion of increasing Antarctic ice pack caused by increased winds. Since the Eastern Tropical Pacific is not entirely decoupled from West Wind Drift given the general pattern of circulation in the SE Pacific, the question arises is the magnitude of the observed overall energy difference in the recently observed “extended” La Nina phase of ENSO condition relative to the the “more normal” ENSO comparable in magnitude to energy associated with the apparent increase in winds and potentially currents around the Antarctic? Could such a coupling or partial coupling explain where the energy for a more “normal” ENSO is going? That is could the energy “missing or delayed” be going instead into a modified current pattern in SE Pacific? Presumably, it does take a lot of energy to move that much water faster, with the heat potentially being redistributed into deeper ocean layers associated with perhaps poorly understood fluctuations of the Antarctic convergence at depth? Or is it that the wind phenomenon of such short/local scale or that the circulation systems are known to be so completely decoupled that this isn’t possible and that some other explanation for the delay in the “normal” ENSO pattern is required? Are there good overviews as to how much annual/decadal variation there is in world ocean currents and could unexpected aspects of “trends” in their coupling explain where all the additional trapped energy is going? Of course, all this is of interest to an ichthyologist potentially interested in understanding where to look for expected changes in fish distributions given the tremendous diversity of depths occupied by different groups of fishes.